Large sites on the other hand are much more difficult to handle. One criticism of Honeycomb housing that is often raised is the concern about ‘getting lost in a maze'. It's true that winding roads can be disorienting. In small scale development, maintaining a sense of location is easy. It’s the big sites that pose a special problem especially if the issues pertaining to scale and monotonous repetition are handled badly. The problem of wayfinding is closely linked to the scale of a project and the extent to which the housing products are repetitive. Even large terrace housing layouts can be a problem to navigate if the houses all look the same and road junctions are indistinguishable from each other. A proposal in Johor provided an opportunity to show how this issue can be handled. Our client was a government linked company charged with developing a new township near Tangkak which was to be the administrative centre for a new District carved out from the Muar District in the north of Johor. There was already a layout plan for a new township of about 400 acres of which 130 acres were designated as residential. Arkitek M Ghazali was asked to redesign the conventional layout that had already been prepared which comprised mainly terrace houses. The client wanted to assess if a Honeycomb housing was a feasible option. It was a difficult project in that the numbers of houses that were proposed was overwhelmingly high compared to existing demand. In addition, affordability was also a problem. However, for us this exercise could serve as a test for how the Honeycomb layout could respond to problems of wayfinding and scale. One strategy adopted to overcome the problem of scale is the introduction of variety in the layout. A variety of cul-de-sacs have been designed. There are large courtyards with pocket parks of about a quarter of an acre which are usually surrounded by quadruplexes and townhouses. There are medium sized courtyards that are surrounded by a lower density combination of quadruplexes and sextuplexes. There are also small courtyards which are surrounded by triplex and duplex units. On top of these there are courtyards that open up to the main distribution roads and they can vary in size to give each one a unique identity. Mainly, these half-courts contain a combination of high-end duplex, triplex and detached houses. Variety along the winding main roads makes each junction more recognizable from the next. On straight roads we see only the road disappearing into the horizon, but prominent buildings where the road bends can become landmarks that give each stretch of the road its own identity. The Honeycomb Housing Layout for this proposal builds on the “organic” concept that has been adopted by the original Planner for the overall layout. Three housing precincts are proposed with names based on the traditional practice of chewing the betel nut: Kampung Sireh and Kampung Gambir on the northern section and Kampung Pinang to the south. * "Lingkaran Kampung Sireh" (Betel Leaf Village Ring Road) which circles an existing hill. * "Jalan Kampung Gambir" (Gambier Village Road) which connects Lingkaran Kampung Sireh to the main 100’ feet road. * "Jalan Kampung Pinang" (Betel Nut Village Road) which curves through the middle of the southern portion of the land. Branching off from these roads are residential areas which comprise houses that are clustered around courtyards and cul-de-sacs. The dendritic, tree-like, hierarchy of roads allows the numbering of the roads in an easy logical manner that helps people find their way around. This 50 foot wide boulevard, Jalan Kampung Pinang, that gently curves through the site will have a procession of different types of houses and a variety of small parks and amenities along each side of its whole length, such that the features that appear on the left hand side will be reflected on the right side. The effect in to create a complex symmetry that mimics the symmetry found in all forms of life. The houses will all feature Malay architecture with details that will build on the features found on traditional kampong houses found in and around Tangkak. The other, certainly much bigger issue, was affordability. In Tangkak, 43% of the working population earns between RM1,000 to RM 2,000, and 28% earn between RM2,000 and RM4,000. As such, it is advantageous to provide for some housing priced below RM150,000, in particular, to compete in the single storey house category. For this, we have introduced the townhouse type of housing, priced at RM125,000 where the sextuplex unit is further divided into upstairs and downstairs units which belong to separate owners. The quadruplex was proposed as the most common type of house, and it was priced at RM166,000 for the typical unit. Taking into account edge units (the Honeycomb equivalent of corner terrace houses which have extra land), the average price is RM182,000. This was lower than the proposed pricing of the terrace houses at RM188,000 in the original proposal. More expensive sextuplex and semi-detached house types were also included in smaller numbers. 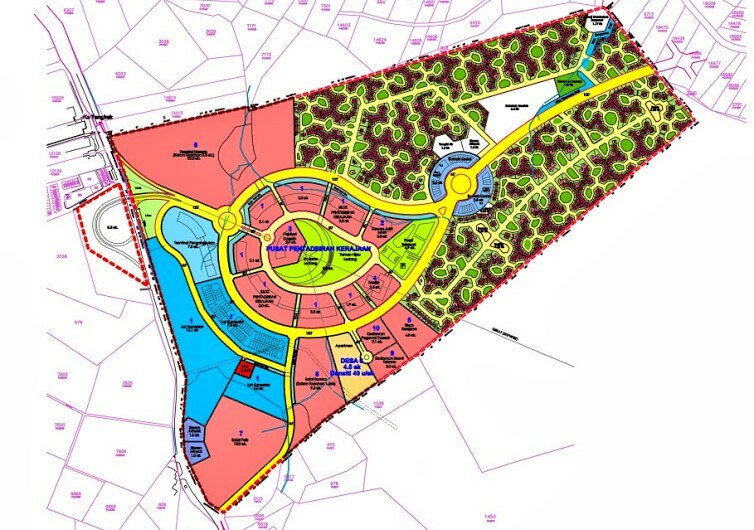 The proposed development was in fact huge compared to Tangkak’s relatively small economy. Too huge. Even with the projected increase I industrial activity, it would have taken time for demand for housing to grow. The developer will have to launch small numbers of units at a time, especially in the initial stages. As expected, the developer decided not to proceed with any of the plans for this new town.